Linda is right! The Harrison Ridge Greenbelt is the only “wild” greenspace in the neighborhood. The 6-acre land is home to many birds and provides a wonderful respite from the asphalt and concrete of our lives. 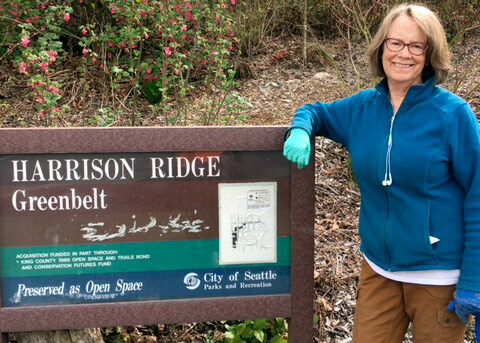 As a human geographer (a scientist who studies why people live where they live), Linda is especially aware of the benefits of interacting with nature for people of all ages, but especially for children. Anyone can meander the paths and sit among the trees. Additionally, the Stewards provide field work experiences for the Urban Forestry class at The Bush School. The Forest Stewards of the Greenbelt work under the auspices of Forterra. Forterra’s mission is to secure wilderness, local farms, and city greenspaces from unbridled development. They provide tools, plants, and support to the Steward volunteers. Forterra functions as a non-profit under the umbrella of Green City Partnerships. They supervise the restoration of hundreds of thousands of acres that will now be saved for our future generations. Stop by and say hello when you see us! Please consider joining our team! Even one or two hours a month can make a big difference. Working together, we can all enjoy this special park.